Courtesy of a good friend, a bunch of us went over on the weekend to see Canada’s Women Hockey Team play Slovakia. It was the game where the poor Slovakians lost 18-0 and were outshot 67-9. To start off, I have to give massive credit to the Slovakian goalie, who really did try. She made some amazing saves but in the end it just wasn’t enough. At one point they had literally just finished announcing who had scored the last goal when the next one went in. The Slovakians also had some good chances, mostly because the Canadians were incredibly sloppy while passing in their own end. The crowd was pretty amazing, applauding the Slovakian goalie every time she made a great save (she made a lot of those) and at the end of the game giving the entire Slovakian team a standing ovation. 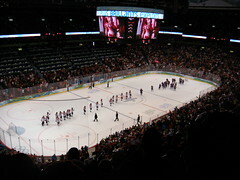 The Canadian team was also gracious enough to simply skate off at the end, without receiving the same. But before we even sat down for the game, we already had a bit of fun with venues. The website listed both Thunderbird Stadium at UBC and Canada Hockey Place (ex-GM Place) as the venue, so when we arrived at Thunderbird Stadium for the game we were rather rudely surprised to learn we had gone to the wrong place. Amazingly, there is no direct bus connection between the UBC and Hockey Place. So off on a quest we went, one bus and two Skytrain rides later, arriving shortly before the 5pm start. Or was it the 4:30pm start. The website and our tickets disagreed on that too. Which brings us to security. The reason we were two hours early in getting to UBC was for the expected security, a saving grace and it turned out. Processing 18,000 fans into a stadium in a short period of time is hard but it ran fairly smoothly, even if it took the better part of 45 minutes standing in the concrete jungle that is the Georgia/Dunsmuir Viaducts and Skytrain line. After the game we set off to see the Olympic torch, which was by that point very neatly blocked off with an elegantly-designed barrier of 10′ of chain-link fence and concrete. Gulag chic was definitely in. Transit was one of the bright spots of the whole day. The bus was busy, but not overly so. Of the many Skytrain trips we took, on all three lines, there were usually seats. I shudder to think what it would have been like without trains running on 90 sec headways and all those new cars that Translink purchased recently for the Expo/Millenium Lines. However, I really wonder just how much VANOC paid Translink for all the extra service. Too bad VANOC is beyond FOI reach. They claim they are going to release their budget after the games, so we will know eventually. Aside from seeing the game, I also wanted a chance to ride the Brussels- and Bombardier-supplied streetcar running on the new track between the Olympic Village Canada Line station and Granville Island. Thanks to the good transit connections, I managed it. It was smooth, clean, and quite busy even at nearly 9pm when we rode it. Apparently earlier in the day it had been packed. The car also had a pleasant odour of brand-new leather, coming from the hanging straps. Made a nice difference from the usual smells you can run into on older transit buses and trains. We were fortunate enough to have a relative of one of my friends to stay with in Vancouver, so we didn’t have to find some of the very scarce hotel space available. They also lived in a decent place for transit, so we could get to and from their place without too much difficultly. Attempting to drive down would have been insane and impossible and there are few park-and-rides anywhere on the Skytrain system. I am glad I had a chance to go and see the Olympics and all the effects it has had on Vancouver. 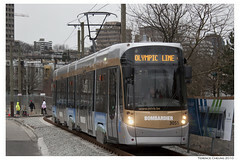 I really hope that the City of Vancouver finds some way to keep the Olympic Line running, although they will need to find new vehicles. Not reopening the Georgia and Dunsmuir viaducts would also go a long way to making the downtown a better place. As for the rest of the legacy of the games, that remains to be seen. The Globe and Mail had an excellent article yesterday about a panelist at the Detroit Auto Show daring to go against the conventional wisdom and point out that electric cars will not save the world. Nor will cars running on hydrogen, hybrids or even recycled bovine flatulence. Why not? Cars causes many ills for society, including urban sprawl, air pollution, high costs of road construction and maintenance, and health problems due to sedentary life styles. Notice that exactly one of those problems is solved by alternative fuel cars: air pollution. The rest are all caused by the inherent nature of the car and they will only be solved by returning our cities to a more balanced mix of travel choices. This doesn’t mean that cars are going to go away anytime soon, rather that again they will merely be one of many choices. And despite what the car-shilling Frontier Policy Institute tells you (Globe and Mail article, original paper), this will be a good thing for poor people. How do we get from here to there? We need to start investing in improvements for biking, walking and transit and some of that will require giving exclusive road space to transit and bikes, which is not very politically popular. Cities need to be bold and try and get ahead of the curve, as Vancouver and Portland did with their streetcars, both of which were funded by the city rather than the local transit agency. For bikes we need to move beyond bike lanes, to protected paths and bike boulevards. Pedestrians need wider sidewalks and shorter crosswalks. None of this will be cheap, but then again nor is the status quo. The Henry Ford Foundation is working hard to preserve a General Motors bus. This bus carries the serial number of #1132 and used to be part of the Capital City Street Railway Company or The Lightning Route, established in 1886, in the city of Montgomery, Alabama. So why is Ford money being used to save this GM bus? Because one day in 1955 a woman decided that she didn’t need to get up just because of her colour. The rest, they say, is history. Interestingly, the same year that the Lightning Route was being built, another street railway got it’s start up north. That was the Scranton Suburban Electric Railway in Scranton, Pennsylvania. Why Scranton? Jane Jacobs was born in there in 1916; who was later made famous by her opposition to Robert Moses in New York.